Whether you live in studio flat or a 2,000-square-foot home, how you use your space changes everything—and we’re here to prove it! For example, who’d have thought that 3 siblings ranging in age from kindergarten to high school could share a 13 x 13-foot apartment bedroom? They do now, thanks to smart solutions like wall beds with built-in desks and creative storage for their essentials. Think it would be impossible to downsize? You’ll be inspired after you meet a woman who built a house about a quarter of the size of her original one. (Bonus: She has very low utility bills and can clean the whole place in a snap!) And if your closets always end up a cluttered mess, we’ve tapped experts who share how to zone and outfit any available space you have to make room for everything. 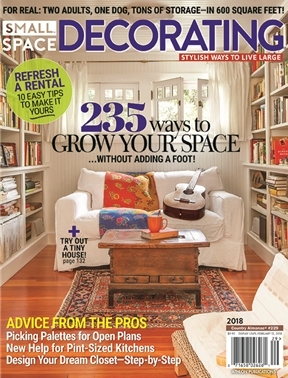 Peruse attractive work-live spaces, get the skinny on problem-solving kitchen designs and discover the smartest ways to personalize a rental—and more—in this idea-packed issue of Small Space Decorating.